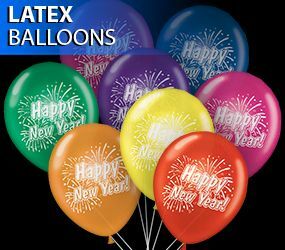 Save on dozens of different foil and helium rated latex balloons. We have many different balloon sizes and shapes available. 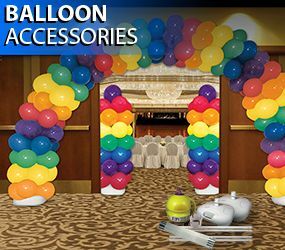 In addition to balloons, shop all of the accessories that you will need to inflate, tie, and weigh down your balloons at your party. 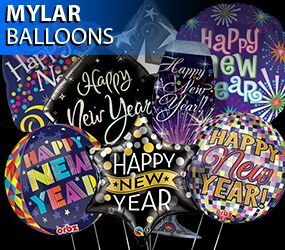 200 Assorted Balloons sizes 9-14" all styles and colors. The top selling holiday for balloons is by far New Year's Eve. These are inexpensive decorations that look great as centerpieces on tables, or bundled at doorways. We even offer a balloon arch for your balloons that you can put over main entrances to let everyone know where the party is going to be held. Our bulk packs of both latex rubber balloons and foil mylar balloons are deeply discounted to save you money on your special event decorations. All of our balloons are helium rated, but helium is not required to inflate your balloons. We have hand inflators and electric balloon inflators to make blowing up your balloons simple and affordable. Nothing is worse then having to run to a department and over spend for balloons when you need several hundred to fill an event space. That is why we offer our balloons in wholesale bulk packs that are around 50% off of the cost of those department store balloons. The options are limitless when you order a bag of 100 rubber balloons to scatter around your event space. The balloons are so inexpensive that you can fill one of our huge balloon drops and drop hundreds of balloons from the ceiling. If you would like to see a crowd go crazy, drop 500 balloons on top of them while the DJ is heating up the dance floor.